Buyers who purchased a Tesla directly from the manufacturer are out an extra $14,000. 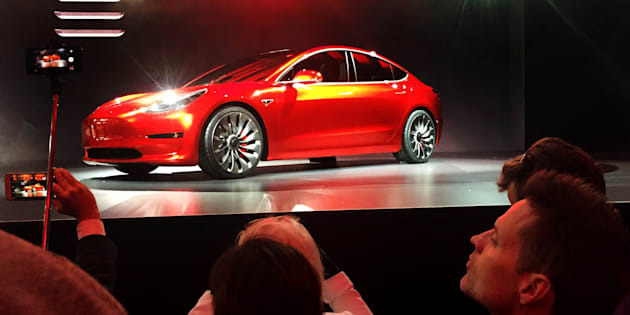 A Tesla Model 3 sedan, the automaker's first car aimed at the mass market, at its launch in Hawthorne, Calif., March 31, 2016. Ontario's new government has cancelled the rebate program for buyers of electric and hydrogen vehicles, just as sales of the vehicles were soaring thanks to the arrival of the new Tesla Model 3. Sorry, electric car drivers, you're officially out of fashion in Ontario. The province's new government has cancelled the rebate program for buyers of electric and hydrogen vehicles, just as sales of the vehicles were soaring thanks to the arrival of the new Tesla Model 3. And the point of the cancellation? To make gas cheaper. Premier Doug Ford campaigned on a promise to scrap the province's cap-and-trade system for carbon emissions, as part of a plan to reduce gas prices in the province by 10 cents a litre. The new government says scrapping cap-and-trade will save Ontario households and businesses $1.9 billion per year. "Given the Electric and Hydrogen Vehicle Incentive Program and the Electric Vehicle Charging Incentive Programs are funded through cap-and-trade proceeds, these programs are cancelled," the province's Ministry of Transportation said in a statement. UPDATE 7/16/2018: The government of Ontario has confirmed that people who ordered a Tesla Model 3 directly from the manufacturer will have to cover the $14,000 extra cost of the vehicle, now that the province's electric car rebate program has been cancelled. Ontario says it will honour the rebate for any Teslas or other electric cars that dealers ordered, provided the cars are sold by Sept. 10. But for those who purchased their Model 3 directly from Tesla, the rebate will not be available — even if the buyer ordered the car before the July 11 cutoff. "This seems to be a decision that benefits traditional dealerships in Ontario," a Tesla buyer told CBC News. "Tesla will be fine. They have 300,000 people waiting to buy my car. They aren't going to be hurt by this at all. It only hurts people like me." The move comes in what otherwise might have been a watershed year for sales of electric vehicles in Canada. According to numbers from Green Car Reports, electric vehicle sales exploded in Canada in the first half of this year, largely thanks to the arrival of the Tesla Model 3, a new, more affordable model from the electric car maker. Tesla's Model 3s began shipping to Canada in May. Green Car Reports estimates that some 3 per cent of all car sales in Canada in June were plug-in electric vehicles, up from around 1 per cent in 2017, and just 0.6 per cent in 2016. With Ontario's rebate program cancelled, that growth rate will likely falter. The program offered rebates of between $5,000 and $14,000 per electric vehicle, depending on the model. The province added the Model 3 to its list of eligible cars earlier this year, the only Tesla model for which a discount is available. Some critics assailed the program as a subsidy for the rich; after all, even with the rebate, most electric cars are still pricey. For instance, buyers of the Mercedes GLC plug-in hybrid qualified for a $7,000 rebate. Buyers of some models of BMW i3 and X5 qualified for up to $12,000 in rebates. With Ontario nixing its program, only British Columbia and Quebec still offer rebates on electric vehicles, the Globe and Mail reports. The move also means the U.S. now has more generous incentives for electric vehicle sales than Ontario does. The Republican-controlled U.S. Congress last year reduced the incentives for electric cars as part of its tax overhaul, but the program still offers a $7,500 rebate for the first 200,000 electric cars a manufacturer delivers. After the 200,000 mark, the rebate is gradually reduced until it reaches zero. Tesla Motors recently delivered its 200,000th car to the U.S. market, meaning rebates on its cars will now be reduced. Ontario says it will honour the rebate for any eligible cars that were delivered to consumers, plated and registered by July 11 of this year. It will also honour the rebates on any inventory that dealers had on their lots on July 11, and on orders they made with manufacturers, provided the cars are sold by Sept. 10.